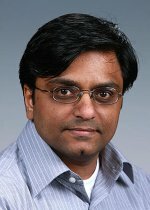 Dr. Mahantesh Halappanavar joined Pacific Northwest National Laboratory in December 2009. His work focuses on parallel graph algorithms and spans several applications including contingency analysis of electric power grids, statistical textual analysis, numerical linear algebra, information security and fault tolerance. He explores the interplay of algorithm design, architectural features, and input characteristics targeting massively multithreaded architectures such as the Cray XMT and emerging multicore (Intel, AMD) and manycore (nVIDIA) platforms. Mahantesh graduated in 2009 with a Ph.D. in Computer Science from the Old Dominion University, Norfolk, Virginia. His doctoral research was in the emerging interdisciplinary field known as combinatorial scientific computing (CSC) that employs combinatorial algorithmic techniques to solve scientific computing problems. He developed new approximation algorithms for graph matching-a fundamental combinatorial problem with numerous applications in science and engineering. He also developed software targeting the Department of Energy's leadership class machines for the approximate graph matching problem and demonstrated scalability across tens of thousands of processors. Chatterjee S., M. Halappanavar, R. Tipireddy, and M.R. Oster. 2016. "Game Theory and Uncertainty Quantification for Cyber Defense Applications." SIAM News 49, no. 6:1-5. PNNL-SA-119091. Chatterjee S., R. Tipireddy, M.R. Oster, and M. Halappanavar. 2015. "A Probabilistic Framework for Quantifying Mixed Uncertainties in Cyber Attacker Payoffs." National Cybersecurity Institute Journal 2, no. 3:13-24. PNNL-SA-114140. Lu H., A. Kalyanaraman, M. Halappanavar, and S. Choudhury. 2014. "Parallel Heuristics for Scalable Community Detection." In 28th IEEE International Parallel & Distributed Processing Symposium Workshops (IPDPS 2014), May 19-23, 2014, Phoenix, Arizona, 1374-1385. Los Alamitos, California:IEEE Computer Society. PNNL-SA-99348. Scherrer C., A. Tewari, M. Halappanavar, and D.J. Haglin. 2012. "Feature Clustering for Accelerating Parallel Coordinate Descent." In Advances in Neural Information Processing Systems 25: 26th Annual Conference on Neural Information Processing Systems (NIPS 2012), December 3-6, 2012, Lake Tahoe, Nevada, edited by P. Bartlett, et al, 28-36. La Jolla, California:Neural Information Processing Systems Foundation. PNNL-SA-88340. Scherrer C., M. Halappanavar, A. Tewari, and D.J. Haglin. 2012. "Scaling Up Coordinate Descent Algorithms for Large l1 Regularization Problems." In Proceedings of the 29th International Conference on Machine Learning (ICML 2012), June 26, 2012, Edinburgh, Scotland, edited by J Langford adn J Pineau. Madison, Wisconsin:International Machine Learning Society. PNNL-SA-87037.